I was asked if I carried anything coast-to-coast on my bicycle ride across America, that I did not use. Above the photo shows most of the items I did not use. The long sleve shirt was to have gone with a pair of khakis that I left at home during my rest days in July. I also left a pair of jeans, my rain coat, a long sleeve jersey and light weight cycling tights home at that time. Early on I mailed about 6 pounds of gear home from Columbia Falls, Montana, including a cotton polo shirt, a metal pot for cooking, a long sleeve jersey and a small duffle bag. Out of curiosity, I weighed each item not used. 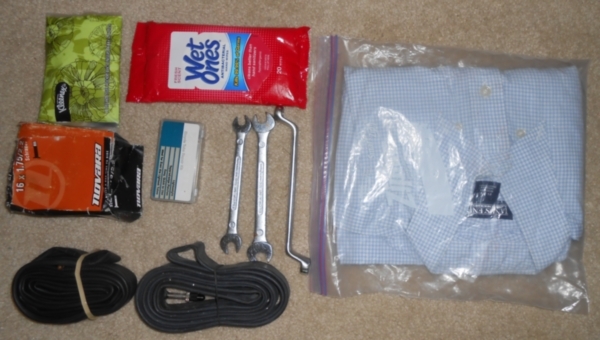 Long sleeve cotton shirt: 240g; Kleenex: 20g; wrenches (for brakes) 180g; tube2: 120g each; patch kit: 20g; tube for B.O.B trailer: 110g. Not included in the list is a small box of Park self-adhesive patches and another tube carried in an under-seat bag. The total is 1040 grams or 2.3 pounds. This was my first loaded bicycle tour. Next time I will be more selective about what I carry. Some of you may be thinking, what difference will a couple of pounds make. I was told there was more than 50,000 feet of climbing from Ticonderoga, New York to Bar Harbor, Maine. A rider has to lift all of that weight. That means an additional 115,000 foot-pounds of work for that portion of the ride. I read a book early this year in which a mountain climber that had been to the summit of Mt. Everest cut the handle off his toothbrush, even on less challenging climbs. Later I read of a cycling tourist that does the same thing. I’m not sure I will go that far. On this bicycle tour the weight of my gear, trailer, bicycle and 3 full water bottles totaled 60% of my body weight. My goal for the next tour is to reduce that ratio substantially.